We are experiencing a strange issue we will sometimes get (empty) responses or ticket bodies. We use the IMAP mailbox polling to autocreate tickets. Unfortunately they don't seem to work. If you need any more info please let me know. Are you seeing any error in your PHP error log? ntozier nope, no errors in PHP. E-mail gets send to our support@rjsafety-security.nl emailbox (because IMAP polling is not allowed for this environment) and then gets redirected to support@sensorcentrale.nl (this mailbox allows IMAP polling). This was the header for the email I could find that created the (empty) ticket body. Sorry for the late reply, been busy here. You posted the headers but not the raw content, this is the other half of the email data. We need this for testing; you can send a test email to that address, let it redirect/fetch, and if it does the same thing send us the raw headers and body of this that way it's nothing confidential. Once we get the data we can do some testing on our side and try to replicate, etc. What mail provider(s) are you using (for both email addresses) and how is the mail "redirected"? Are you using a forwarding rule, if so, how is it configured? 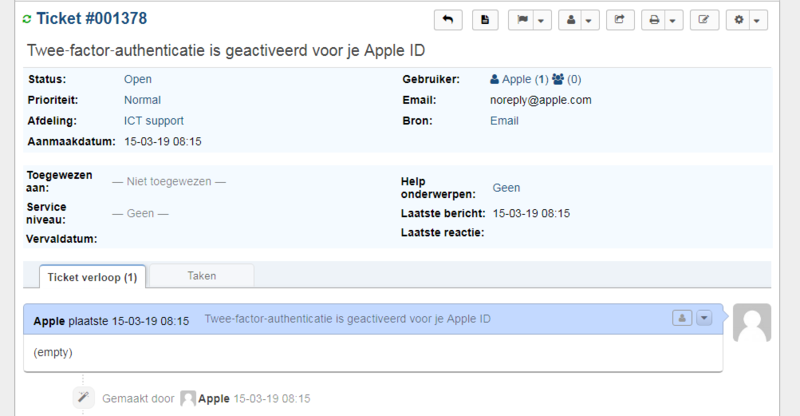 Does email sent directly to "support@sensorcentrale.nl" get fetched properly (ie. is it only mail redirected to the address that messes up) or is all mail from that address messing up (regardless of being redirected)? Funny thing is, the (empty) messages occur randomly. One time the response or email will create a perfectly fine ticket or response and the other time it will create the (empty) message. Question 1: Our email is hosted by our IT provider. 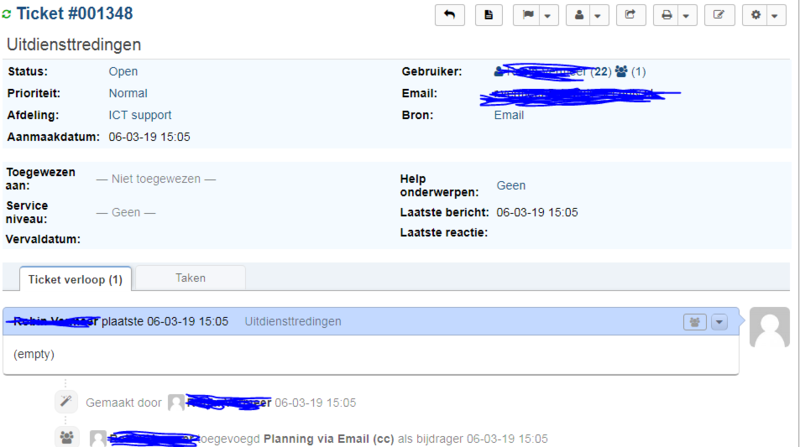 I know they use Microsoft Exchange for the emailaddress associated with support@rjsafety-security.nl. I would guess they also host the e-mail of support@sensorcentrale.nl with Microsoft Exchange but I can't say for sure and also not which version. Both of these e-mailaddresses are hosted by the same company. E-mail gets redirected so not forwarded. I don't know how they created the rule itself. I hope you got some more needed information and good luck with testing. I'm having a similar problem ... except I'm using remote email piping from a mail server to another server hosting the osTicket instance. I'm using automail.pl on the mail server. Mostly the script works, but sometimes it doesn't. The headers of the message are coming through ... but not the body. 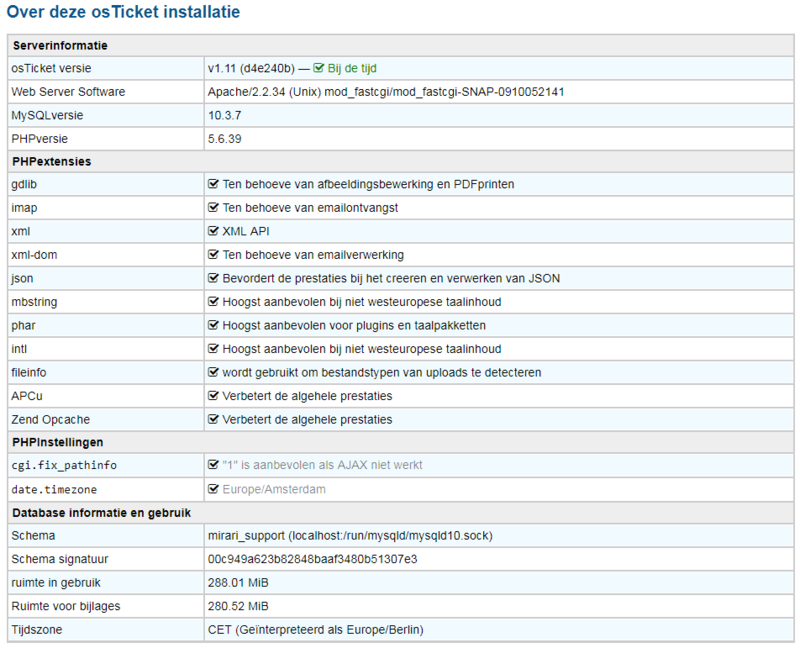 I'm running osTicket 1.11 on Amazon Linux 1 with mySql. Any related errors via your Apache/PHP/Database/Mailserver error logs? Also try the changes in the Github link below and see if this resolves the issue. KevinTheJedi I'm not really sure how to apply the github changes . Unfortunately I can't access the mailserver error logs. Can't find any related errors for apache, php and the database. KevinTheJedi Seems to be still happening. I applied the modifications referenced in ticket 4777. Any chance the email "TO" address might be a factor? I recently migrated from in house servers to cloud servers ... and the support email address changed. I set up a forward from the old address to the new address, but it ends up not being the same. Sometimes, when a support question is directed to me personally, I use a t-bird plug-in that to redirect the message to the support address. As a result, the message would be delivered to the support address (via automail.pl) but addressed to something other than the actual support email. Actually got another one these! This time it came from Apples automated e-mail service. I doubt it but maybe? It's just extremely weird that another forum user has issues with empty bodies until he switched to fetching (from piping) and now it's all good. For you guys it's quite the opposite. Fetching works for all providers in my testing so I'm not sure what the difference is between your setup and mine. Any additional information will be helpful.